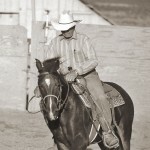 By now your horse should be moving along smoothly at all three gaits in your training arena. So the next thing we’re going to start doing is to ask him to become more responsive and balanced as you guide him around, and to try a few different maneuvers. We’re not really concerned with speed right now, but we do want gaits to be smooth and steady. If your horse is a little “chargey” elsewhere in this manual you’ll find ways to solve that problem. Also, while we talk about lots of variations of the circle, you’ll want to spend a lot of time working in big circles—the size you would do in a reining pattern. 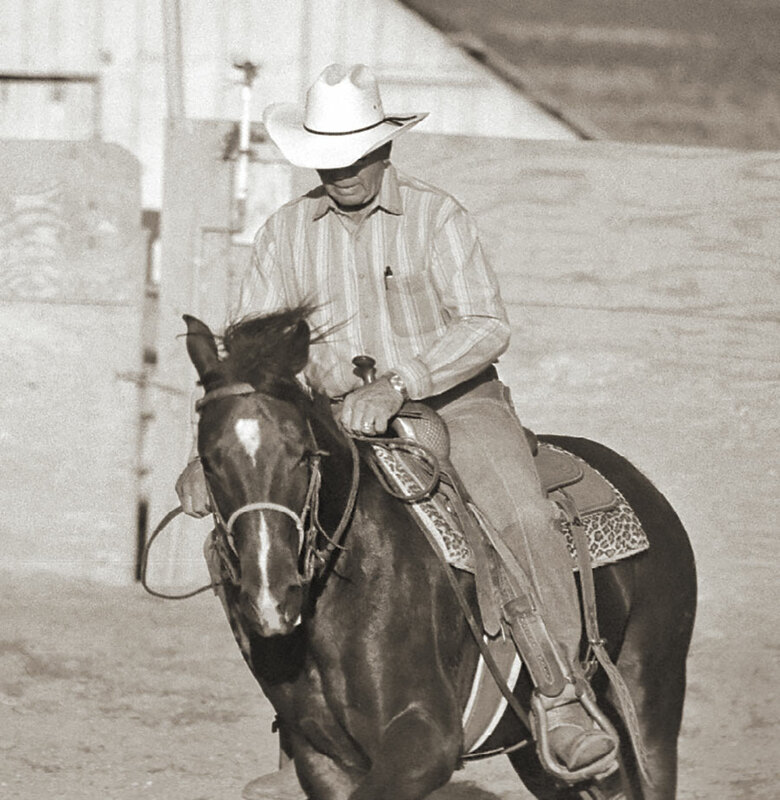 In a reining class you’ll spend more time on your circles than anything else. You want your horse to guide so easily that once you put him on a circle he almost stays there on his own. We’re going to be adding speed to that circle in the future, so you want to spend time now making sure he is really comfortable in them. The shoulders-out exercise consists of deliberately doing the same move that you would use to correct a dropped shoulder. What you want to do is pick up the inside rein to keep his nose pointed to the center of the circle, and then use your inside leg to drive the horse’s shoulder and ribs to the outside of the circle. Remember that as you do this you want to keep life in both your hands and your legs, and you want to keep the horse driving from behind. It’s easy sometimes to get so preoccupied with the mechanics of what you’re doing with the front end that you start losing your momentum, but don’t let it happen. I’d encourage you to start this exercise at the trot and then move on to the lope when you get the feel for it. Once you’ve gotten the hang of this exercise you should never have to be too concerned about dropped shoulders again—if the horse starts to lean into the circle with his shoulders, just pick them up and put them way to the outside like you did in this exercise. Then turn him loose and see if he doesn’t stay on track better. This exercise is just the opposite move of the one above. Here you are taking the horse’s nose to the outside, while you use your leg to move his shoulders and ribcage to the inside of the circle. Just like before, keep life in your hands and legs and keep driving your horse from behind. You don’t want to lean into the circles, you want to make him bend his spine the opposite direction from the circle that he’s traveling on. This is a good prerequisite for the countercanter, an exercise we will work on in the next level. At first, both of these exercises will seem awkward to you and your horse, but as you do them (and I’d encourage you to do them quite a bit) you will be developing feel in your own riding and flexibility and responsiveness in your horse. These are also great exercises to develop your horse athletically, making him better prepared for the harder work ahead. I usually do them every day, especially as a warm-up for my more advanced horses. Like the Five Easy Pieces, shoulders-in and-out are great diagnostic tools to see if something’s stiff or not working before you start your more intense training work..